Spare ribs have a built-in handle to reduce saucy mess. Ribs are perhaps the biggest debate among barbecue enthusiasts, with the largest debate concerning whether or not to coat the ribs in barbecue sauce or eat them dry. While baby rack ribs are taken from the part of a rib rack closest to the spine, spare ribs are taken from the side closest to the belly. They have more meat on the bones, but are usually tougher. Ribs can get messy while eating, especially when slathered in barbecue sauce, a factor that must be considered when you eat spare ribs. Prepare at least four ribs or up to half a slab of spare ribs per person. 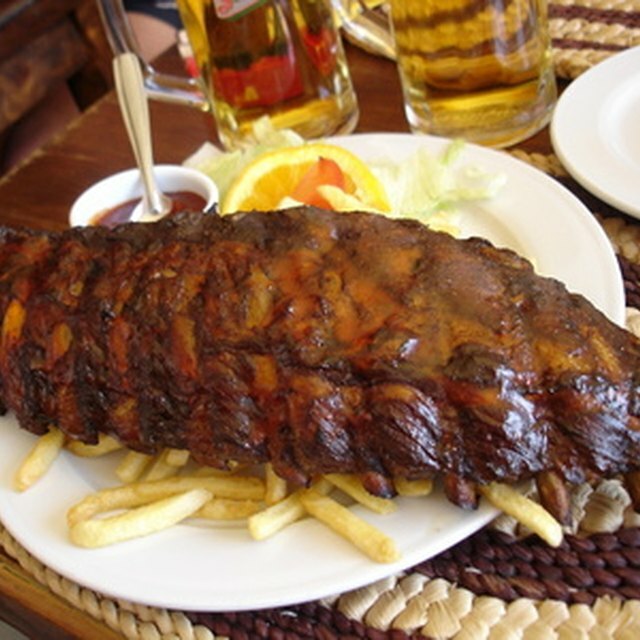 A slab of spare ribs has about 14 individual ribs, which would equal out to four to seven ribs per person. Allow the meat to rest for about five minutes after removing the ribs from the grill or oven so the juices inside the meat can redistribute to all parts of the meat. Leave the racks whole, cut them in half, or cut them down to individual bones, as desired. If you're having an outdoor barbecue, mess is expected, so whole and half racks of ribs are acceptable. If you're serving ribs indoors, they're much easier to serve and eat when cut into individual pieces. This largely depends on the number of people you need to serve. Cut the ribs halfway between bones to ensure both sides of each bone has an even amount of meat. Whole and half racks of spare ribs are common in Southern barbecue cuisine, while Asian-style spare ribs are usually served individually. Place the ribs on a large platter, separated according to size, if applicable. If you have adults and children with different-sized appetites, you might leave some large racks and cut some into individual pieces. Separate the different sizes so they're easy to serve. If you're serving spare ribs to a large crowd at a cookout, use two or more platters so guests don't have to wait in a single, long line. 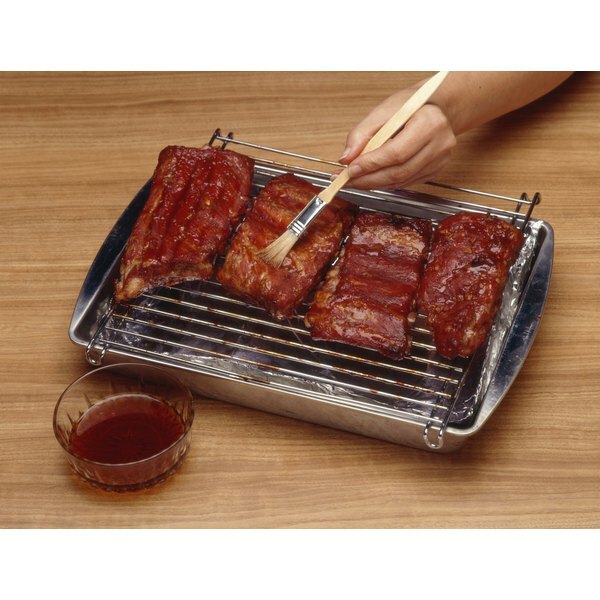 Place a pair of tongs with each platter of ribs for serving; a fork often causes the rib meat to fall off the bones. Choose side dishes that are appropriate to the flavors of the ribs. If you skipped the barbecue sauce, practically any side dish is appropriate. Carolina-style barbecue dishes are often served with crunchy cole slaw mixed with light mayonnaise. A simple baked potato and corn-on-the-cob pair well with sweeter barbecue sauces. Asian-style barbecue spare ribs are commonly served over a bed of rice to absorb the excess sauce and vegetables on the side. Place the bowl of rice on the table beside the ribs so you can plate your rice and add the ribs on top in one location. Serve spare ribs on heavy plates, such as ceramic plates, rather than paper plates to support the weight of the ribs. While heavy-duty paper plates might be able to support the weight, wet barbecue sauce and other wet foods can soften them, making it easy for a rib bone to poke through the plate. Hold the bones as handles to keep your fingers relatively clean when you eat the spare ribs. The meat shrinks while cooking, leaving a piece of bone sticking out on one or both sides. You can grab two bones and pull them apart when eating a whole or half rack. This can get messy, so feel free to cut a larger portion of spare ribs into individual pieces. If you cut the ribs into individual pieces, use the handle when you eat, similar to how you would hold a chicken drumstick. Eat the meat off the bone, similar to how you would eat corn off the cob. In many cases, the meat will slide directly off the bone with only the slightest effort. Keep napkins and wet napkins readily available at the dinner table so you can keep your fingers and mouth clean. Spare ribs coated in barbecue sauce inevitably lead to sauce on your fingers, mouth and sometimes even your cheeks when you eat the ribs with your hands. Even dry-rubbed spare ribs can be messy. Saucy spare ribs are one food with which it's perfectly acceptable to wear a napkin as a bib to protect your clothing. Dirty Smoke BBQ: What are Spare Ribs vs. St Louis Style Ribs? Real Simple: How Many Ribs Should I Serve At My Barbecue? Nicholas School of the Environment at Duke University: Country Ribs or Spare Ribs? How Do I Cook Pork Spine?